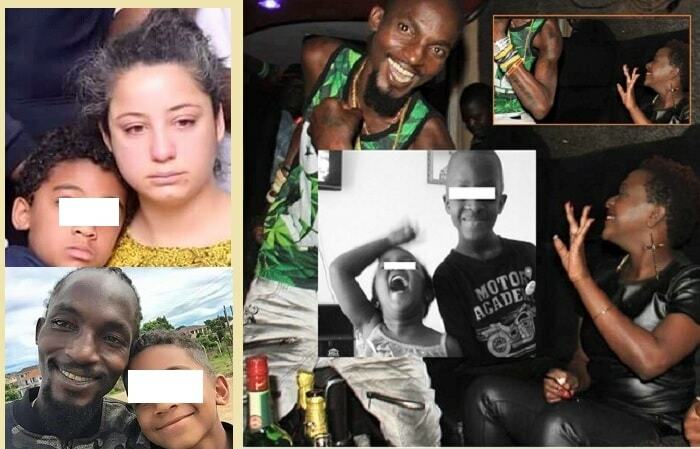 In a post-funeral family meeting, they confirmed the official number of the late Moze Radio's children that he left behind to be six. Popular artist Moze Radio who passed on yesterday morning left behind three kids, that include a son and daughter from fellow singer, Lillian Mbabazi. Lillian stays with the kids in Rwanda and until his death, she was by his bedside much as they had separated. The only post she made on her IG is a black color clearly confirming the situation at hand. Kellen is the Mzungu lady who paid the first batch of monies that was required on day one after Moze Radio had been admitted on Jan 23 at Case Hospital, she has a son with the fallen singer. A few days at the hospital, there was a bit of a scuffle between Lillian and Kellen with the latter wondering why all the attention was going to Lillian and yet she had abandoned the singer and moved on. They later sorted out their issues and focused on taking good care of the father of their children who unfortunately did not make it. A requiem mass is slated for today at Rubaga Catherdal starting 2:00pm and thereafter, the body will be taken to Kololo Airstrip for a night vigil. He will be buried on Saturday at 4:00pm in Kagga, Nakawuka off Entebbe road.